In July when asked about the enormous $170 million budget for his primary campaign, in which he has no opponent, Bush responded "Every day, I'm reminded about what 9/11 means to America.... We're still threatened," adding that he wants to "continue doing my job, and my job will be to work to make America more secure." The single-minded focus on September 11 has even led to attempts to rewrite history. At a congressional retreat earlier this year Bush declared, "Prior to September the 11th, there was apparently no connection between a place like Iraq and terror." In fact, Iraq was added to the State Department's list of terrorist states in 1979. Observers have noted that the administration's attempts to keep the events of September 11, 2001 in the public consciousness include imagery as well as statements. The frequent appearances with troops and military equipment provide convenient contexts for referring to the war on terrorism. On Labor Day Bush chose to appear before members of one of the unions that worked on clearing the World Trade Center site. Yet, it is unclear whether Bush's invocation of the 9/11 attacks will continue to serve him well. 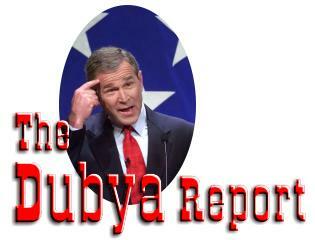 Bush recently admitted that there was no Iraqi involvement in the attacks. Polls show that the public now regards the economy as more important than the war in Iraq or the war on terrorism. The Washington Post's Mike Allen noted recently "Bush's earlier popularity for his handling of the attacks' aftermath never translated to approval for his domestic policies, and now his overall approval rating is receding." Families of those who died on 9/11 have highlighted the administration's interference with investigations of the attacks. And the White House has been accused of misleading New York City residents about environmental safety in their aftermath. Bush's job approval rating has returned to within one point of the low for his term in office, which was reached on September 10, 2001. His disapproval rating then was 39%; it is now 43% -- the lowest it has ever been during his time in office, and the first time it has exceeded 40%. According to the Gallup Organization, the two factors most responsible for the drop in Bush's approval ratings are (1) negative perceptions about the situation in Iraq, and (2)concern for the economy. 52% of those surveyed between September 8 and 10 characterize "things going badly." Bush's approval rating on handling the war in Iraq dropped 6 percentage points since late August, from 57% to 51%. With regard to the economy, only 21% of those surveyed had a favorable view of economic conditions in the US. 45% of those surveyed approved of Bush's handling of the economy -- 7% points lower than his overall approval rating, and the lowest of the four approval ratings that the September 8-10 poll measured. Ironically, given Bush's attempt to link the war in Iraq to the war on terrorism in his speech, the Gallup poll found that 64% of their respondents approved of Bush's handling of terrorism, although even that measure was lower than in August. Bush spoke about Iraq in a prime time address on Sunday September 7. While implying and explicitly admitting that things were not going well, he nonetheless finished his speech by announcing that he would request an additional $87 billion in funding for the war in Iraq and the war on terrorism -- topics which he sought to link throughout the speech. 59% of those surveyed told the Gallup pollsters that they believed the Bush administration had no clear plan for handling the situation in Iraq, up 5% from two weeks earlier. And 51% said that Congress should not approve Bush's request for increased funding. The Bush speech infuriated even conservatives. Columnist David Brooks, writing in the New York Times complained that Bush presented what amounted to "a virtual relaunching of the efforts to rebuild Iraq ... as if they were stately extensions of the policies that commenced on Sept. 11, 2001." Brooks speculated that sometime during the brush clearing vacation in August, Bush must have received a "scathing review of how things were going in Iraq" from some of his advisers. The policy changes may have also received some momentum from the bombing of UN headquarters in Baghdad on August 19. Brooks quotes an unidentified "close Bush advisor" as saying that Bush suggested in a phone call to National Security Advisor Condoleeza Rice that the bombing could be "turned into an opportunity to internationalize the rebuilding effort." But, in Brooks's view, UN involvement "is a long journey for only a modest reward." The important initiatives, he wrote, were to push for increased funding, and to set in motion specific steps to hand over power to Iraqis. The plan for turning over control to the Iraqis, quipped Brooks, "reads like a treatment program for Imperialists Anonymous." A Washington Post poll conducted in August 2003 found that nearly 70% of those surveyed believed that Saddam Hussein had a role in the attacks on September 11, 2001. Congressional investigators have recently confirmed that there is no evidence of this, and on September 17 in response to a question from CNN's John King, Bush himself acknowledged that there was no evidence of Iraqi involvement in the attacks. Democrats and some independent observers, however, have argued that the public perception reflects implications and suggestions by members of the administration that links existed between the Hussein regime and al-Qaeda. As we've noted previously in The Dubya Report, these insinuations persisted despite CIA Director George Tenet's admission in an October 2002 letter to Congress that the CIA's understanding of any relationship between Iraq and al-Qaeda was "evolving and is based on sources of varying reliability." Among the other evidence that an Iraq-al-Qaeda connection did not exist, is a Top Secret report from British Defense Intelligence, leaked to the BBC, acknowledging that while there may have been contacts in the past, "any fledgling relationship foundered due to mistrust and incompatible ideologies," and that Osama Bin Laden characterized Iraq's Ba'ath party as an "apostate regime" adding "His aims are in ideological conflict with [Hussein's] Iraq." Critics suggest that the administration sought to foster a public perception of an Iraq al-Qaeda connection in almost every speech about Iraq by administration officials. In his commentary on the Post's August poll reporter Dana Millbank noted that administration officials began suggesting the Iraqi connection soon after September 11, 2001. Speaking on NBC's Meet the Press in late 2001, Vice President Cheney stated that it was "pretty well confirmed" that the presumed mastermind of the September 2001 attacks, Mohamed Atta, had met with an Iraqi intelligence official. The meeting, which supposedly occurred in Prague, Czechoslovakia in April 2000 was never confirmed. In fact, the congressional report on the attacks released this summer stated, "The CIA has been unable to establish that [Atta] left the United States or entered Europe in April under his true name or any known alias." Clear examples of trying to establish guilt by insinuation occurred in Bush's speech on May 1 announcing an end to major combat in Iraq. once again on NBC's Meet the Press, Cheney cited the alleged Prague meeting, although he added "we've never been able to develop anymore of that yet either in terms of confirming it or discrediting it. We just don’t know." ...[T]he war in Iraq has made it easier for al-Qaeda in several ways. It's drawn our resources out of Afghanistan, number one. Number two, it serves as a great recruitment device for al-Qaeda when they're trying to get more people to join, the fact that the United States is occupying Iraq serves as a great incentive. And thirdly, we have now deployed 130,000 Americans in a place where it's much easier for al-Qaeda to attack them.... [B]ecause we are in Iraq things are better for al-Qaeda and worse for us in the war on terrorism. Clarke called the administrations's implication "that by putting U.S. troops in Iraq, we have decided-- the United States has decided-- where the battle will take place, and that it will not take place in the United States" fallacious. "There's nothing stopping al-Qaeda terrorists from coming to the United States. They choose where they're going to fight us. And they can choose to fight us both in Iraq and in the United States. And in fact, they are," he added. While acknowledging that al-Qaeda has been "degraded" by the US and allies having apprehended "many of the managers," Clarke noted that the absolute impact on the organization is unknown. "The CIA estimates of the number of people who were trained in the camps in Afghanistan range between 20,000 and 80,000. And the United States and its allies have only caught 3,000 of them. And there have been new people joining al-Qaeda since we invaded Iraq," he said. Well we did make it the central front. The Iraqi government was not engaged in terrorism directed at the United States. The last time it had done that was 1993, so we had gone nine years without any Iraqi- sponsored terrorism directed against the United States. Now that we're there occupying the country, the two groups are engaged in terrorism against us: The former regime and al-Qaeda. And there's a third group waiting in the wings and that is Iran and Hezbollah. So, yes, it's the central front on terrorism, but only because we've made it so. It was not a terrorism problem for the United States prior to our invasion. ... [B]y virtue of occupying the country we caused a small element, a residual Saddam element to become terrorists and attack our troops. And we also moved 130,000 U.S. troops a lot closer to al-Qaeda in a place where it's more easy for them to attack us. So the only reason it's the central front is because we're there. Prior to our invading, Iraq did not pose a terrorist threat to the United States. Terrorism, Clarke concluded cannot be dealt with in isolation. You know, we do have the support of the governments throughout that region in the Middle East, but we don't have the support of the people. We don't have the support of the people in Pakistan, we don't have the support of the people in Saudi Arabia, and we can't just deal with terrorism as a law enforcement and intelligence matter. We also have to deal with it at that time diplomatic and ideological level, and we're not doing a very good job of that. The Post recently quoted a "presidential advisor" as saying that avoiding the appearance of exploiting the attacks will be a challenge for White House politicos during the coming campaign. The task is not likely to be made any easier by the Republican Party's its convention in NYC in late August, temporally and spatially linking it to the 9/11. Interviewed in June 2003, some families of the September 11 victims took issue with the administration's attempts to characterize itself as the world leader in the war against terrorism. They have found themselves in a prolonged struggle with the Bush administration to obtain answers about, in the words of Eric Boehlert writing in Salon.com, "what went wrong that day, why so little has been fixed, and why virtually nobody has accepted any responsibility for the glaring failures." Legislation authorizing a commission to investigate the 9/11 attacks was first offered in Congress in late 2001. At the time the military campaign in Afghanistan was used as an excuse to delay any investigation. After Bush spoke to then Senate majority leader Tom Daschle, a White House spokesman said "The president thinks it’s important for Congress to review events in a way that does not unduly burden the defense and intelligence communities, as they are still charged with fighting a war." Nonetheless, intelligence committees in the House and the Senate continued to prepare for formal inquiries similar to those conducted in connection with the Iran-Contra affair. In January 2002 Bush and Vice President Cheney each contacted Daschle asking that the inquiries be limited to the intelligence committees. Rejecting the administration request, Congress responded by setting up a full joint inquiry, headed by Florida Democrat (and now presidential candidate) Senator Bob Graham, with Rep. Porter Goss (a former CIA agent) serving as vice chair. Experienced Senate staffer L. Britt Snider was appointed head of the inquiry staff. Snider had played a key role as an investigator in the Iran-Contra inquiry, uncovering information about government attempts to read the telegrams of private citizens. In the 80s and 90s he served with CIA Director George Tenet on the Senate intelligence committee staff, and was later appointed inspector general of the CIA by Tenet. Rather than working to his advantage, however, Snider's association with Tenet became a liability, and some committee members charged that the inquiry would produce a whitewash. Snider made the mistake of recruiting a former CIA employee who had failed the lie-detector test for his security re-certification, and Snider resigned in April 2002. Snider was replaced by former federal prosecutor Eleanor Hill, who had served as a Senate investigator during Iran-Contra, and later became inspector general at the Pentagon. Closed hearings began on June 11, 2002, and although public hearings were initially expected to begin on June 25, the closed hearings continued with testimony from CIA Director Tenet, FBI Director Robert S. Mueller III, and NSA Director Lt. Gen. Michael V. Hayden. The agency heads' statements were eventually released to the public, but initially information available on the hearings was limited to general characterizations from members of Congress who were in attendance. On June 7 ABC News reported that the NSA had intercepted cables on September 10 concerning the 9/11 attacks, and on June 19, CNN reported the text of two intercepts. Despite the fact that NSA intercepts of al-Qaeda phone calls had been revealed as long ago as 1998, and that the administration itself had made public in September 2001 the existence of the pre-9/11 intercepts in an attempt to show that US intelligence services were not completely incompetent, Bush and Cheney pounced on the CNN reports as evidence that the Congressional inquiry was not secure. Ultimately the FBI was asked to investigate the source of the leak, leading to what has been characterized as "an agency under investigation by Congress conduct[ing] a simultaneous criminal investigation of the investigators." Nearly 100 people, including most committee members and 60 staffers, were investigated by the FBI, who demanded calendars, date books, working papers, etc. be turned over to them. Needless to say the work of the inquiry was seriously impeded. Writing in the March/April issue of the Bulletin of Atomic Scientists, John Prados described the FBI investigation as "only the most visible part, the tip of the iceberg, of an extensive administration campaign to limit the damage from the investigation." Richard Clarke of the National Security Council staff is the only White House staffer known to have testified before the inquiry. The administration would not permit Secretary of Defense Rumsfeld and Secretary of State Powell to testify. White House ally, and Senate minority leader at the time, Trent Lott, blocked a request to hire more staff for the inquiry. Interviewed on the first anniversary of the 2001 attacks, Republican Senator Richard Shelby told the NY Times, "You know we were told that there would be cooperation in this investigation, and I question that. I think that most of the information that our staff has been able to get that is real meaningful has had to be extracted piece by piece," adding, "Time is on the side of those people who’ve been investigated." Senator John McCain told Time magazine earlier this year that the administration the "slow-walked and stonewalled." The inquiry's final report, issued in December 2002, was initially classified so that intelligence agencies could review it. The agencies recommended classifying two thirds of the 850+ page report. The White House argued that material in the report should not be released in the interests of national security. Critics questioned that post ion, however, noting that Bush had permitted Japanese Prime Minister Junichiro Koizumi and Russian President Vladimir Putin to join him for his morning intelligence updates while they were at the so-called "western White House" in Texas. The agencies revised their recommendation on May 29, 2003, and the declassified report was finally released on July 24. The report identified lapses on the part of intelligence agencies, including the failure to place certain terrorists on watch lists, and not investigating reports of members of Muslim groups seeking flight training in the US. It noted that the CIA was aware of the potential for using aircraft as weapons. And it recommended organizational changes within the intelligence agencies. But the inquiry was unable to tell the full story, especially in connection with Bush himself. During the public hearings, inquiry head of staff Hill restated DCI Tenet's position that "the president’s knowledge of intelligence information relevant to this inquiry remains classified even when the substance of that intelligence information has been declassified." Back on October 20, 2002, after the public phase of the investigation had concluded, Bob Graham put it this way: "Frankly, there is a piece of information which is still classified which I consider to be the most important information that’s come to the attention of our joint committee." In March 2000, the [Intelligence Community] obtained information regarding the types of targets that operatives of Bin Laden's network might strike. The Statute of Liberty was specifically mentioned , as were skyscrapers, ports, airports, and nuclear power plans. "In sum, the 9/11 Report of the Congressional Inquiry indicates that the intelligence community was very aware that Bin Laden might fly an airplane into an American skyscraper," Dean concludes. Evoking an earlier inquiry with which he was intimately involved, Dean asks "Is the White House covering up what the President knew, and when he knew it?" An independent commission created in late November 2002 will nominally continue the investigation where the congressional inquiry left off. But Bush's initial appointment of Henry Kissinger to lead the group evidenced the administration's continued attempts to retain partisan control of any investigation. When Kissinger withdrew after refusing to make public his list of consulting clients, former NJ governor Thomas Keane as chair, and former congressman Lee Hamilton as vice chair offered some hope of objectivity. Critics have warned, however, that the commission's extremely wide mandate, ranging from border security to immigration, and the relatively short amount of time to do its work will likely produce results similar to those of the congressional inquiry. Further complicating the independent commission's task, witnesses testifying before it have not been placed under oath, with the result that Bush administration officials have not always provided complete answers. For example, the commission was unable to obtain specific answers from NORAD and FAA officials as to whether it would have been possible to scramble jets to intercept the hijacked aircraft once FAA had notified NORAD of the situation on the morning of September 11, 2001. At a meeting in Washington one month before the congressional inquiry report was finally released, families of victims of the 9/11 attacks described the independent commission as having been created "virtually in spite of the White House." Last fall, despite bipartisan agreement in Congress, the administration successfully delayed the formation of the commission until after the midterm elections. Only after a candlelight vigil by family members in Lafayette Park across from the White House was the commission finally created. "Bush begrudgingly signed [the commission] into law," one family representative told Salon.com. "Since it was created, he's done everything to take the teeth out of it. His fingerprints and Karl Rove's are all over this." Recent revelations suggest that the administration's cover up extended beyond "slow-walking and stonewalling." In April 2002, then EPA administrator Christine Todd Whitman told PBS News Hour "Everything we've tested for, which includes asbestos, lead, and volatile organic compounds, have been below any level of concern for the general public health." That view was repeated as late as December by assistant regional EPA administrator Kathleen Callahan, appearing before the New York City Council. "I think the results that we're getting back show that there isn't contamination everywhere," she said. The dangerously toxic industrial chemical, PCB. Mercury, known to cause neurological damage and birth defects. Pulverized concrete, which can cause lung damage. Dioxin, which can damage the central nervous system and cause birth defects. On August 21, the report of the EPA's own inspector general concluded that "when EPA made a September 18 announcement that the air was "safe" to breathe, it did not have sufficient data and analyses to make such a blanket statement." In particular, the report noted, "data was lacking for several pollutants of concern, including particulate matter and polychlorinated biphenyls (PCBs)." Moreover, the report explicitly accused the White House of watering down EPA's health warnings. ... The White House Council on Environmental Quality influenced, through the collaboration process, the information that EPA communicated to the public through its early press releases when it convinced EPA to add reassuring statements and delete cautionary ones. asbestos – not other air pollutants. EPA did not have results for many pollutants, including dioxin, mercury, and other metals, until September 20 -- two days after Whitman proclaimed the air "safe." Rep. Jerrold Nadler who represents the ground zero neighborhood is blunt in his criticism. "The EPA response to the Sept. 11 attacks was more than a complete disgrace," Nadler he said. "It was, in fact, malfeasance." An August 2003 article in the Journal of the American Medical Association asserted that their mothers' exposure dust from the WTC may have contributed to low birth weight for dozens of newborns. And nearly all of the 400 workers who visited a mobile medical clinic while engaged in building cleanup operations in lower manhattan showed evidence of long term health affects, including respiratory infections, allergies and skin rashes, according to Dr. Stephen Markowitz, of the Center for Biology and Natural Systems at Queens College. The same dust, of course, was present in the apartments of many residents of lower Manhattan. The EPA's own final report calls the release of dioxin from the WTC collapse the largest release in the world with concentrations 170 times that of the second largest release in North America. "It would be reasonable to conclude that the concentrations to which people could potentially be exposed ... within or near the WTC site found through the latter part of November , are likely the highest ambient concentrations that have ever been reported," the report stated. Rep. Nadler, and Joel Kupferman of the New York Environmental Law and Justice Project, requested that EPA designate lower Manhattan an EPA Superfund site, which would establish a clear protocol for cleanup. The EPA final report indicates that the level of dioxin contamination would normally trigger a Superfund designation, but in the following paragraph state, "The EPA judges these incremental cancer risks to be of minimal concern," because ambient air had returned to normal levels of pollutants. EPA spokesperson Bonnie Bellows dismissed the notion of a Superfund designation, saying "Superfund is there primarily to deal with abandoned sites and where there is no other source of funding for cleanup." Where once the administration was motivated by greed, now it's driven by fear.... Now it has all gone wrong. The deficit is about to go above half a trillion dollars, the economy is still losing jobs, the triumph in Iraq has turned to dust and ashes, and Mr. Bush's poll numbers are at or below their pre-9/11 levels. Nor can the members of this administration simply lose like gentlemen. For one thing, that's not how they operate. Furthermore, everything suggests that there are major scandals - involving energy policy, environmental policy, Iraq contracts and cooked intelligence - that would burst into the light of day if the current management lost its grip on power. So these people must win, at any cost. Allen, Mike "Bush Cites 9/11 On All Manner Of Questions: References Could Backfire" Washington Post 11 Sep. 2003.